What's not to love about the clear, flat water lake to paddle on? Paddling is best in summer and fall; in winter, the water levels drop too low. Late spring is okay. Originally a favorite site of the Shawnee and Cherokee Indians, Grayson Lake State Park is home to many outdoor activities—including world-class paddling. 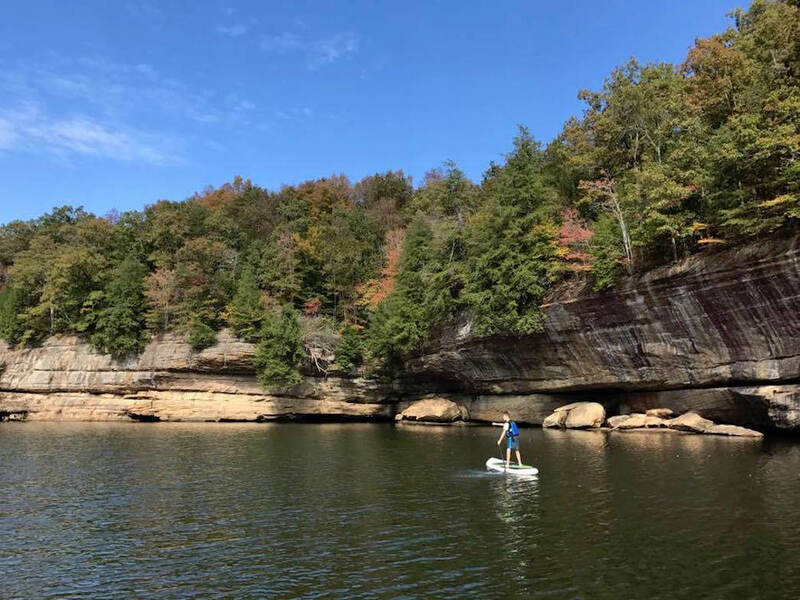 Considered by many paddlers to be the best blueway east of the Mississippi, the reservoir is home to 100-foot sandstone cliffs, caves, waterfalls, and is home to abundant, diverse wildlife. It’s surprising how many Kentuckians have never experienced the beauty here. It’s one of the state’s best-kept secrets. If you are traveling to the Bluegrass State and enjoy nature at all—no matter what time of year—you won’t want to miss out on this breathtaking lake. The scenery at Grayson Lake is incredible. If you are fortunate enough to spend the day here, paddling along the sandstone cliffs and exploring caves and coves, it will be one you will not forget. The Grotto is the most popular and the quintessential must-do, if you can hit only one. It is the main draw to paddle at Grayson Lake State Park. Tucked away among mossy sandstone cliffs, the seductive Grotto Falls on Far Clifty Creek will lure you into its natural sanctuary. Be sure to also visit Craig Creek Falls, Gray Hollow Falls, Sam Carroll Falls, Stafford Creek Falls, and Lick Falls. Behind Hidden Falls, one of the bigger waterfalls, you can paddle through a crack in the sandstone to go into a secret cove in the back. Some of these secluded spots appear other-worldly—and you almost feel as if you’ve been transported to someplace deep within Middle Earth, where you can let your imagination run wild. The combination of beech-hemlock trees contributes to the surreal landscape. Anyone and everyone will love Grayson Lake State Park. Its natural beauty and intoxicating waterfalls will make for a day to remember. Directions: Take KY 7 South of Grayson; pass the dam on Grayson Lake; turn right on the gravel road just before reaching the bridge over Clifty Creek arm.